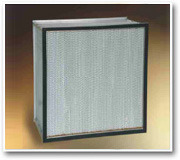 HEPA filters remove a broad range of airborne contaminants, including fine dust, smoke, soot and pollen. HEPA filters are used in final filter applications including hospitals, electronics, nuclear, pharmaceuticals, laboratories, aerospace, food processing and optics. They can also be used as pre-filters in cleanroom environments and other critical applications. Spectrum's HEPA (High Efficiency Particulate Air) filter is constructed from high quality wetlaid microglass media and uses corrugated aluminum separators. The pleat pitch is designed for minimum air flow resistance and the spacer edges are 'safety rolled' to prevent media puncture. The filter is sealed to the frame with a two - part polyurethane adhesive to ensure zero leakage. Our 'hot - melt mini - pleat' filter design configuration increases its energy efficiency due to lower pressure drop in comparison to conventional deep pleat HEPA. The 'Spectra Mini-Pleat' filters are thus the lowest-cost filters to operate over the filter's life. In new applications, using 'Spectra Mini-pleat' HEPA filters can reduce the cost and size of the filter housing. Spectrum's mini-pleat HEPA filters offer outstanding performance and are factory scanned before they reach the customer. Individual testing under rigid quality control and modern assembly methods ensures conformance to specifications. HV (High Volume) HEPA filters can be used for upto 4000m3/hr. These filters are developed for demanding final filter applications. The wet laid micro glass fibre filter media is pleated and separated using hot melt beads and housed in a robust filter frame. Spectrum high-temperature filters are used for air filtration applications involving temperatures >100°C up to 260°C for air supply and upto 540°C for exhaust air. The filter pack is constructed by pleating a continuous sheet of special grade water-resistant fiberglass media around hemmed-edge corrugated aluminium separators. The filter frame is made from grade 304 stainless steel with a high temperature silicone sealant rated for 260°C or a glass pack sealant rated for 540°C in exhaust applications. A woven glass gasket is provided to seal the filter to the mounting device.